Address: Avenida de las Playas, 84, Puerto del Carmen (Lanzarote), Islas Canarias. VIK Hotel San Antonio enjoys a beachfront location on Playa de los Pocillos Beach in Lanzarote. It features outdoor pools, tennis courts, and a spa area with sauna and steam bath. WiFi is available in public areas. The air-conditioned rooms at the San Antonio Hotel Lanzarote are brightly decorated and include a private balcony. A fridge, and tea and coffee making facilities are available for an extra cost. The VIK San Antonio Lanzarote complex has a buffet restaurant, cocktail bar and pool bar. Puerto del Carmen is a short walk away, with many shops, bars and restaurants. 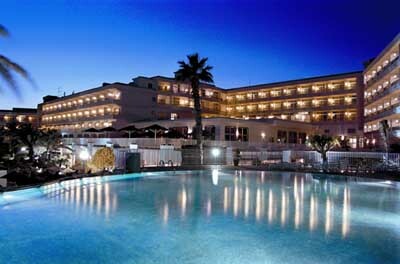 The hotel is just 6 km from Arrecife Airport and Timanfaya National Park is also nearby. The San Antonio VIK Hotel offers free private parking. Please note safety deposit boxes, fridges and tea and coffee making facilities are available for an extra charge. Please note that WiFi is not available in the rooms, only in public areas.